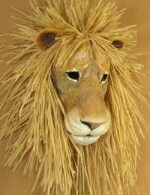 Note: I recently created a new pattern for a lion mask. It’s an African lion, not a cougar like the one Julie made, (but it is a lot easier to make. 🙂 ) The downloadable mask pattern is made with cardboard pieces taped together, plus one layer of paper mache and that lovely raffia mane (made with a cheap table skirt). It isn’t waterproof, though, like Julie’s mountain lion. Today we have a real treat. 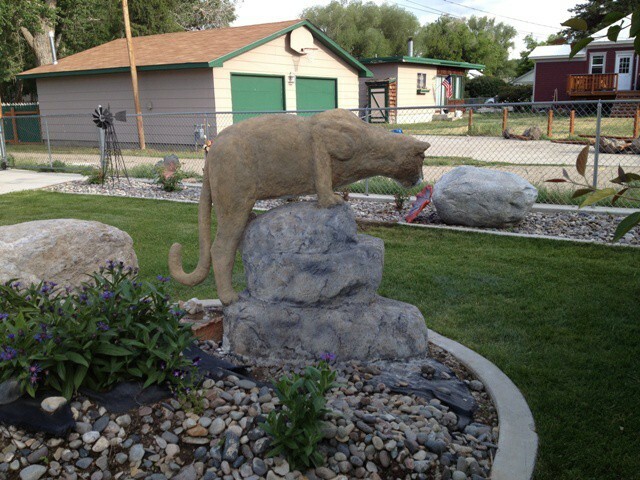 Julie showed us her mountain lion and fox last week in a comment on the Daily Sculptors page. I asked her if she would do a guest post to show us how she made the sculptures, and she graciously agreed! Because her sculptures are covered with concrete, they can safely stay outside. Hello, I’m Julie Ellis, I’m married with 2 sons, a lovely daughter-in-law and 5 wonderful grandchildren. I’ve been a professional paper hanger, worked in a bronze casting foundry in the wax chasing department, and my husband’s a concrete contractor so I do his office work. I started my art “career” with oils and pastels and after working at a bronze foundry I tried my hand at sculpting. I’ve also created decorative concrete stamps. My experience has been wide and varied. It’s been an adventure. After coming across Jonni’s website and getting her “Animal Sculpture“ paper mache book it’s opened the door for me to create large pieces of art that up to this point I’ve not been able to afford. Thank you Jonni! Mountain Lion: 59″ nose to tail/ 54″ tall from bottom of base to top of lion/ 46″ at the widest part of the base/ 12″ body width. Lion armature, made with rebar and Styrofoam. 1: I made a 1″ graph on the photo I used then enlarged it to a 5″ graph on a 2″ x 4′ x 8′ sheet of Styrofoam (instead of cardboard). My son welded an armature for me using 3/8″ rebar and attached it to a square base. You can see some of the armature in the photo. The armature is oblong with bars attached for leg supports. The leg supports were 4″ from center but I think it would have been better at 5″ from center since the figure is 12″ wide. Had my hands full there! I used a Demand hot knife to carve where the rebar would fit on the Styrofoam. Using insulation foam spray, wire, hot glue and anything I could get my hands on, I attached the Styrofoam to the rebar and glued Styrofoam spacers between the body and legs. 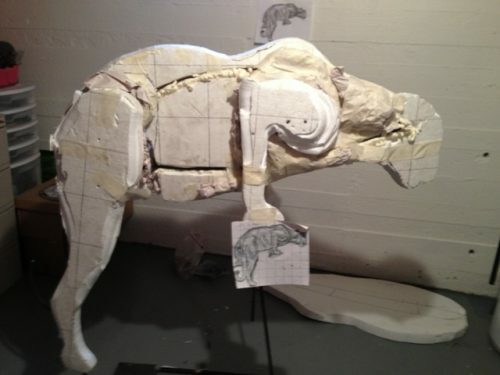 Then I began developing the figure with newspaper and masking tape as in “Animal Sculpture”. For support for the rock base Donnie welded rebar to attach the legs making it more stable and give it more strength. It also gave me something to start building the rocks on. Adding the underlying layer of paper mache. 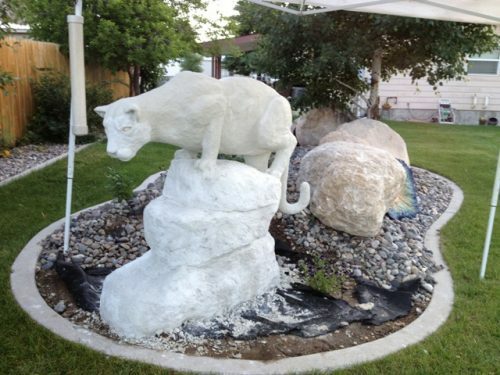 2: I put a layer of paper mache clay on the mountain lion figure. I realized after putting cement on the fox I needed to make the pm clay pretty rough so the cement has something to hang on to. So I put another rough layer on. This is somewhat similar to using wire on a house to apply stucco. You can see how rough I made it in my photo. I put a cement bonding agent on the pm clay coated figure preparing it for cement. I think any cement bonding agent will do the job. Ask your local supplier about it. 3: For the rock base I used large pieces of Styrofoam to fill the void then wrapped it with chicken wire and tied it to the rebar armature. I stuffed voids with newspaper and some plastic sacks (recycling!) The places I couldn’t reach to stuff paper I used the foam spray to fill voids. I prepped the foam spray areas with bonding agent. Where there was chicken wire exposed I felt the cement would go through and hold to the wire. Think if I was to do it again I’d put pm clay on the base. There are some great websites to help you with color and texture for rocks. 4: ALWAYS ALWAYS! USE GLOVES! Cement will eat your hands alive. I used white QUIKWALL Bonding cement for my final layer. It”s very fibrous and strong and I’ve used it for other cement projects. It has a course texture due to the fibers in it. You can pat it gently to bring up some cream but for the most part if you’re applying it by hand it’s not a smooth surface unless you use a cement trawl. I recommend not mixing more than a half bag at a time. ( Even less until you’re used to it.) Put the dry mix in a wheel barrow (any container you can mix in) and gradually add water. Get it to a little thicker than cake batter consistency. 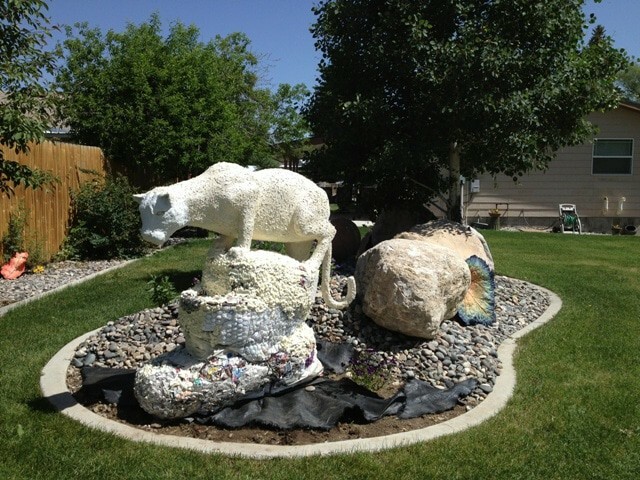 Make cement patties and put them on your sculpture. The cement will start to set up and when it gets too firm I put my hands in water shake them off and work moisture into the patties. It helps if you’re in the shade so it doesn’t go to fast. When you’re done spray your sculpture with water and cover it with plastic so it can cure slowly. Spray it several times a day for three days. The longer it stays moist the stronger it gets. Some modern dams are still curing years later. Lion back, with color added. 5: Coloring: I use Flex cement concrete stain for my color vs. acrylic paint. I like that it’s transparent and has the benefit of being a sealer as well as a color. Saves you a step. There are many different concrete stains. Baby Animal Doll Book is Done! You’re work is amazing. It is truly incredible. 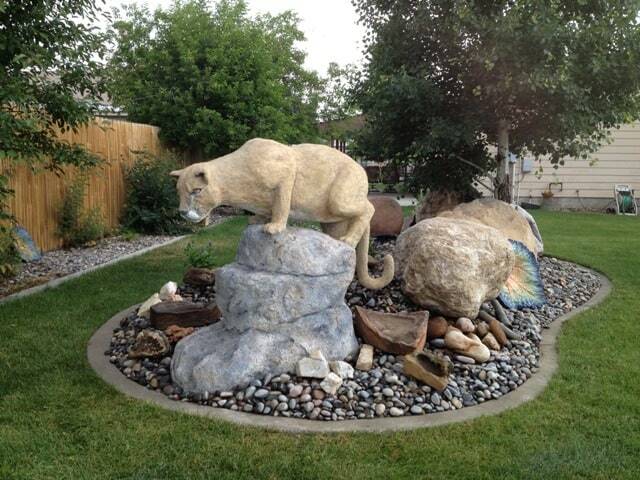 I wonder if you can help me, as I’m looking for a life size cougar for inside my home. I’ve found many that are too small, bronze, or the faces are wrong. I do not have your talent but I know my animals. Getting their coloring incorrect or having them look mean is not what I’m trying to find. If you can steer me in the right direction or if you sell your work, I’d love to hear from you. Either way, it was a treat to see your gift. You are amazing. Am I going blind! Where is the fox? The fox was shown in one of Julie’s comments, a long time ago. I searched through the comments and found it here. Just scroll down if you don’t see the finished fox right away. She really does lovely work. figure skiing. I was able to get large sheets of form. Had a hack of a time getting the pieces to stay together using various glues. Finally attempted to cover the figure with fiberglas, resein and bondo. Two years ago vandals did it in and it went into the garbage. I realize part of my problem was only putting one layer of fiberglass. Since finding your site I have a begun a four foot snow man for the coming Christmas. I made the frame out of chicken wire and have begun coverng it with masking tape and paper mache. 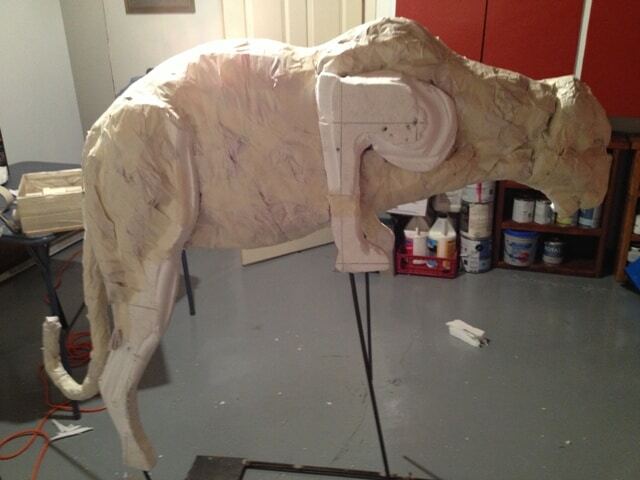 I plan on putting 5 layers of fiberglas over the paper mache and seal it with gelcoat before painting it. I will let you know how things work out. Going to use your Dry Clay for some of the detail work. Hi Frank. It sounds like you have a nice big project planned. Good luck with the fiberglass – I’ve never used it, but it would certainly solve the waterproofing problem that we have with paper mache. I hope you’ll let us see how it turns out. Julie thank you so much for your wonderfully detailed steps and the great photos! I especially loved your photos/explanations in Step 1 about putting a grid on your photo and then enlarging it onto a large sheet of Styrofoam. It probably is understood to do that for those of you experienced in such things, but I’m not experienced, so it was very enlightening. We’re in the process of moving, but once we get settled, I am so eager to begin a project–and I will be buying all of Jonni’s books once we’re there to really jump start the process. I absolutely love this forum! The members are so encouraging and eager to share their ideas and knowledge. Thanks so much! And Jonni, an especially huge thank you to you for making all of this possible! Hi Barb. I’m glad you’re enjoying the site. Be sure to let us see what you make, once you get settled into your new place. Amazing! Thank you for sharing your incredible talent with us.